One of the things they were very clear to teach us was that this new book is just a tool or an instrument. A new book cannot make or break one’s worship experience, it can only be used to highlight certain aspects. As we’ve gone through the book to pick which readings work for us and which do not, what to cut to maintain our double services, what had to be added because we never had the opportunity before…etc., I was thinking about this tool. I am reminded once again of our mission in starting Rock Shabbat. Our mission was to reimagine what prayer looks and feels like, to see if there was a new or different way to be in relationship with God and the Jewish Community. I’m delighted that our new Machzor will allow us to continue this journey with such a celebrated holiday. Our new Machzor returns old texts, reimagines the placement of the shofar service and re-writes and re-evaluates Yizkor. Our new Machzor has multiple English options for every Hebrew prayer and study session pages we cannot hope to spend time covering during worship. This is truly a Machzor to learn from for years to come. As we changed our musical aesthetic for Rock Shabbat we changed how we connected with our community, so I pray that this Machzor will help guide us into a deeper connection with God and t’shuvah (repentence/return) on this and future High Holiday seasons. But let us be honest, while Temple Rodeph Torah has risen to every challenge and embraced change over and over again enthusiastically, change is still hard. And change on the High Holidays is really hard. I promise that most of the sounds of the holiday will be the same, much of the music and certainly the traditional High Holiday melodies will be maintained throughout our worship. But it is very difficult to pray, to be transported, or to feel connection while tripping over unfamiliar words. While the words we’ve chosen are beautiful and meaningful, they will still be new. I hope you will allow yourself to use the tool of these new words to be inspired and transformed and not just frustrated by their newness. I also hope you will take up our challenge to study them. We have several opportunities to learn about the new Machzor: we will be sending out a daily email during Elul with readings from the Prayer book to help inspire t’shuvah during the month proceeding Rosh Hashanah. Rabbi will be teaching his yearlong adult education classes on these books and we will also be holding “rehearsal” services on August 10, 12 and 13th at 7:30 pm at TRT. We are holding open run-throughs of Rosh Hashanah morning, Yom Kippur morning, and Yizkor/N’ilah services (on those dates respectively) for several reasons. Rabbi and I need to become more familiar with these new tools so we can pray and better lead you in prayer. We need to understand the flow from music to text and back again, and we need to understand the timing. And while we wanted an open run-through to help us receive feedback, we also know how much easier a tool can be once you are familiar with it. If you come to experience these run-throughs with us, you won’t be reading the manual while trying to pray and you’ll feel more comfortable and familiar with the text and the worship, more ready for Rosh Hashanah, more ready for the work of relationship with God and community and t’shuvah. I am so excited to experience this Machzor with you. The work Rabbi and I have done so far has lead me to be very optimistic about the potential of these tools. There are so many beautiful passages, so much amazing education and I believe the worship we craft together will be uplifting and change inspiring. Thank you for helping to make this possible by funding the purchase of these new High Holiday Prayer Books and thank you for coming on the exciting journey of Judaism in the 21st century with us. 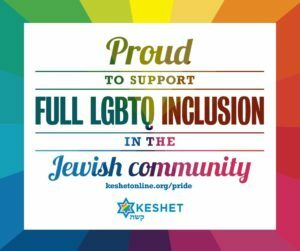 We are ever-changing, the needs of our community are ever-changing and I believe the new, yet constant, message of Judaism can only enhance our lives in this changing world. God’s message is the same, but we often need different words, melodies and context to be open to hearing it, so thank you for being on your Jewish journey with us.